The organizers of West Africa Fashion Awards (WAFA) have announced Fashion Instinct as the official partner of the 2016 event. This makes it second time in a roll for their relationship of producing the event. 'Last year’s ceremony saw over 500 VIPs and industry heavyweights in attendance, the global growth and positioning of West Africa fashion has helped establish the West Africa Fashion Awards as one of Africa’s most anticipated fashion events.' statement made by the organizer. The event is scheduled to be held at Oriental Hotel in Lgos, Nigeria on 26th of March. Red carpet arrivals start at 4:30PM with VIP reception and media opportunities. Guests will be seated at 5:30PM, and the awards show begins promptly at 6:00PM. 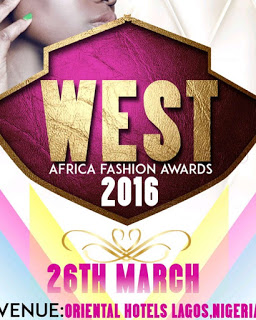 For more information about West Africa Fashion Awards visit www.westafricafashionawards.com. For media inquiries or interviews contact adewole olanrewaju wisdomelite@gmail.com or call 08123194178. For sponsorship information or Fashion Programme advertising space contact Info@westafricanfashionaward.com or call 08029314720.